In Hear This, A.V. Club writers sing the praises of songs they know well. This week, in honor of the return of Mad Men on April 5 for its final seven episodes, we’re looking at some of the show’s most important song selections. 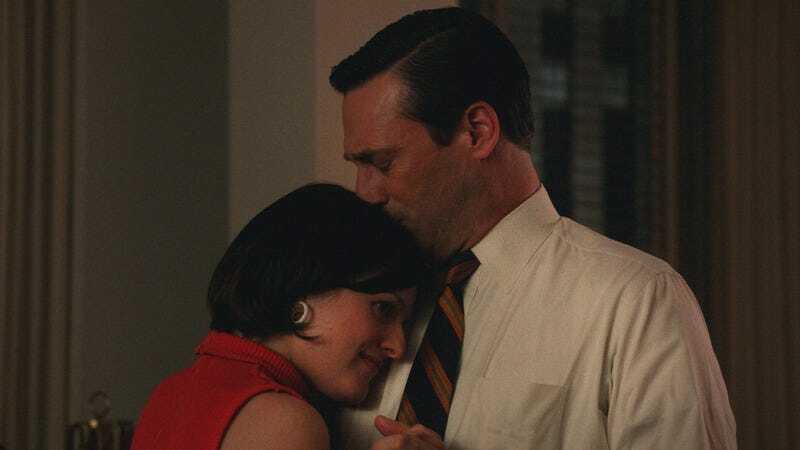 The personal relationship between Don and Peggy has always been the cornerstone of Mad Men. She started as his secretary, but then he got her out of the mental hospital, and she bailed him out of the drunk tank. But as the two moved toward a more balanced level as colleagues, it became difficult for Don to deal with Peggy while her star ascended and his faltered. By season four, Peggy was pissed that Don got a Clio for one of her ideas, after she had sacrificed any semblance of a social life for the job. The pair’s long history came to a head in the show’s best episode to date, “The Suitcase.” After an out-and-out blowup (Peggy: “You never say thank you!” Don: “That’s what the money is for!”), the two spend a platonic all-nighter together, reaching a new level of understanding by the end of it. When he despairs that no one really knows him, she points out, “That’s not true,” and by the next morning, Don asks for her opinion on an ad, and they grab hands. The move is a throwback to Peggy grasping his hand as a come-on in the pilot, but now the two had evolved far past that to equal footing. This new version of their partnership didn’t last long, though. After Don was ousted from Sterling Cooper & Partners at the end of season six, he wound up working for Peggy, instead of the other way around. The years of rising resentment between them finally dissolve, again during a late night. Acting as a partner episode to “The Suitcase,” season seven’s “The Strategy” has Peggy open up about her fear that life has passed her by and she’s missed her chance to have a family. Don reveals what really troubles him: “That I never did anything, and that I don’t have anyone.” After these revelations lead Peggy to tearfully land on a Burger Chef pitch—where “whoever you were sitting with is family”—Sinatra’s “My Way” comes on the radio. Don then leads Peggy in a dance; she leans into him, and he kisses the top of her head. Don and Peggy are both loners, who relied on themselves for their own successes: both definitively doing it their own way. Like Sinatra, they are unapologetic, but now that they’ve succeeded, they wonder what they might have missed on that careful climb upward. The dance to “My Way,” unlike to any romantic or love-tinged song, is the meeting of Peggy and Don as equals, as two loners who, thanks to each other, are no longer alone.